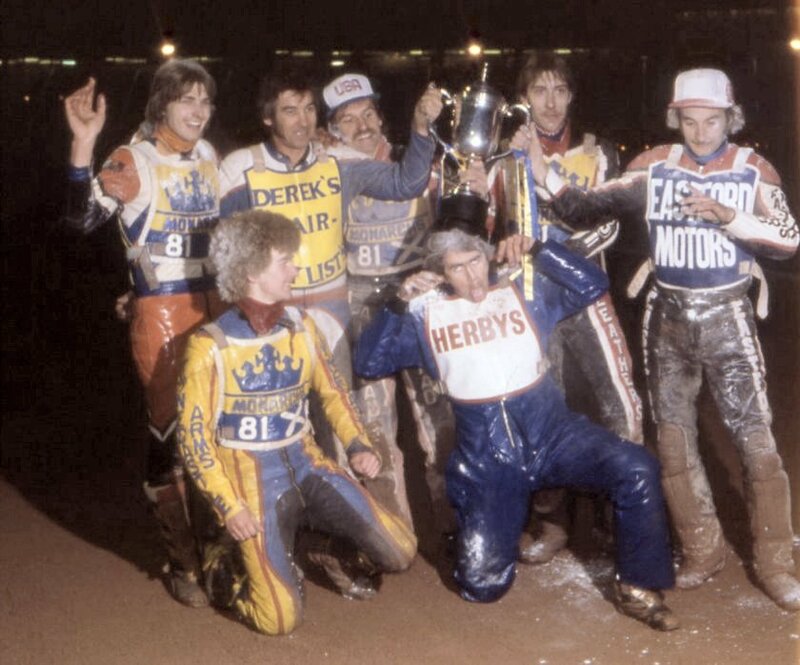 We had an exciting side in 1981, winners of the Fours at Peterborough and challengers for the league title for a big part of the season. We progressed in the cup too, against Exeter, Oxford and Mildenhall, and met Berwick the holders in the final. Bandits had established a reputation as a great cup side, though they were without a home track after falling out with the football team at Shielfield, and with their new track at Berrington still a year away. So the cup final first leg was raced at Newcastle, with Bandits taking a 3-point lead after a fascinating contest. In the second leg we took overall victory, again in a stirring battle. Some of the team wore sponsors' jackets for the winners' photo but you can't hide the happy atmosphere!